For everyone that has read the previous installment of Lame Adventures, you are very aware that I am suffering melancholy over the pending close of my go-to neighborhood watering hole, the Emerald Inn. On the heels of the news of this tragedy, my workweek started with additional acid reflux for I finally got around to calling my health insurer. This call is the exact type I live to avoid. It’s right up there with having to make an appointment for an invasive procedure requiring intubation, coincidentally my least preferred type of hollow body-filling bation. This was a call to argue a claim. I knew that my fifteen-day grace period to pitch a fit was quickly drawing to a close. Therefore, I had to suppress my gag reflex, ring them up, sail through several electronic prompts and one irritating disconnection, before finally getting through to someone with a faint pulse that fell short of his dream career, undertaker. The quasi-corpse did not tell me what I wanted to hear. Dreaded telephone conversations like that one are exactly why the Emerald Inn has served a medicinal purpose in my life for nearly thirty years. Meanwhile, my boss, Elsbeth, had yet to arrive at The Grind. Her absence compelled me to multi-task. Task One was venting the little that remains of my mind into the cold dead ear of my insurer about why I was now being charged a king’s ransom for a routine medical procedure that had previously cost me little more than the court jester’s breath mints. Task Two was simultaneously keeping a watchful eye on my computer screen, should my Lord & Master send an electronic missive my way. Elsbeth’s email: You’ve got to love this one!!! Elsbeth’s Goggles Dog iPhone gotcha shot. Elsbeth (thinking): This Goggles Dog belongs in Lame Adventures! Striking a pose, it is evident that The Goggles Dog was in complete agreement with my superior. Is The Goggles Dog a Lame Adventures hound or what? I vote “woof”! This entry was posted in Humor, new york city and tagged animals, dogs, golden retriever, health insurance hell, office antics, stupid pet tricks. Bookmark the permalink. Thank you for diverting my attention from my own office antics and unaccomplished mandatory phone conversations with the unskilled. Golden retrievers are such good natured fellows. I am still deeply stung by the loss of our landmark watering hole. Thanks for the empathy R. I told Milton that I can bear getting ditched by fickle women incapable of appreciating me, but witnessing the cruel demise of my go-to watering hole is what it must feel like to lose a truly great love. It’s been one of the most treasured relationships of my life, and in this case, the love was mutual. And to think that I had nine, yes NINE, deer lounging in my backyard yesterday morning. Had I been adept with my iPhone I could have added to your LA outsourcing. Of course they’re way too skittish for me to get close enough to affix said Goggles. What do you grow in your back yard that attracts a herd of deer? Or, has one of your prankster-spawn put up a sign urging them to “Eat Here Now”? If you did affix goggles to a deer, that would definitely make this site! Damned if I know. I think re most we’d ever had was 6 or 7. I took some shots with the iPhone but couldn’t get ’em all. It sounds like you could easily herd deer all day your yard is such a deer magnet. Do you barbecue for them, but aren’t they herbivores? come to think of it, I’m rather fond of grilled veggies, too. Well anything that has a dog and a pickup is on my list of great adventures. Wishing your watering hole/cafe/eating place wasn’t closing, V. Where will you go now? Maybe the goggled dog is a good omen, a sign of some kind. Look to the dog,V — there’s your message. He knows what to do — there’s infinite wisdom there. That goggled retriever does look pretty mellow, Brig, but Elsbeth saw him, not me. Maybe he’s a good omen for my boss and there will be a trickle down effect? As a health care provider, I have come to the conclusion that health insurance is simply in the business of taking premiums, not paying claims. It’s why I don’t accept insurance in my small alternative therapy practice anymore. Fortunately, I’m very good at what I do, and I have reduced my rates so that people can afford my services. Anyway, loved the Goggles dog – that would brighten anyone’s day! Cathy, I view health insurance as a horrible money pit that will only get worse as I (to use a word I loathe) age. Even though all of my middle age issues are under control, and I am in overall excellent health, I know I have to have it should something in this potato sack-worthy body crap out or need repair. I loved that dog, too! He was definitely a bright spot in the week. I’d love to see the interview questionnaire insurance companies use when filling their Customer Non-Service openings. Anyone who might show a grain of compassion, kind heartedness, or sympathy must be weeded out immiately. These positions are reserved for the descendants Nazi death camp adminstrators and ex-DMV employees. I take it you’ve chatted with that undertaker wannabe, too, Russell, for it sure sounds like you know him well! Yes, they are a special breed. Unfortunately, you’re quite right, Russell. I believe the Latin term for what they are is very similar to Bureaucraticus Conformistium. Well, when you’ve finally reached the end of the computer-phone menu chain, after the initial disconnect, and connect to Ms. or Mr. Quasi Corpse, who incidentally is sitting in his or her living room in the Philippines, eating peanut butter, you may as well be talking at a Goggles Dog. The part that really stretches my patience is where they talk over you and tell you to sit down and shut up until they finish reading their cue card, the words on which have nothing to do with your query. Actually, my person was here in the US and did listen to my query, but it was clear to me that this was a new rule that was not going to be broken. Hey, I get it, these health insurers have to make a profit at my expense — just like big oil. Hahaha awesome this made me laugh. The dog is soooooo cute! And posing so well. That dog was definitely striking a pose, Pixie! Goggles Dog looks very relaxed in the back there, LA. Great spot by Elsbeth! Tom, I think Goggles Dog knows that’s his spot in the truck whereas Thurber, my family’s dog, is a nervous wreck no matter where he goes. I have a theory that it’s because he wants to be in the driver’s seat. Yes, Audra, Elsbeth is in a league of her own boss-wise. I had pictured you – as I have – screaming at no one in particular through those prompts and pacing back and forth while the terrible music plays through the perma-hold. Do you remember the days before fancy phones when you could hit the handset against your desk in a cathartic release to such angst? The question is, do you feel better? Or did the phone call increase your acid-reflux requiring another Doctor visit? The dog? Camera-ready. I hope you find another watering hole and fast! Actually, Heidi, I remained seated at my desk and relatively calm, internalizing all my aggravation until I was breathing fire. Whenever possible, I try to avoid doctors. Yes, that pooch was SO camera-ready! I must say he made me smile hugely! Milton and I will find another watering hole, but we will miss the Emerald. Calls to insurance companies drain my will to live. You and I are on the same page there. Speaking of living, glad to know that you’re alive, Leo! 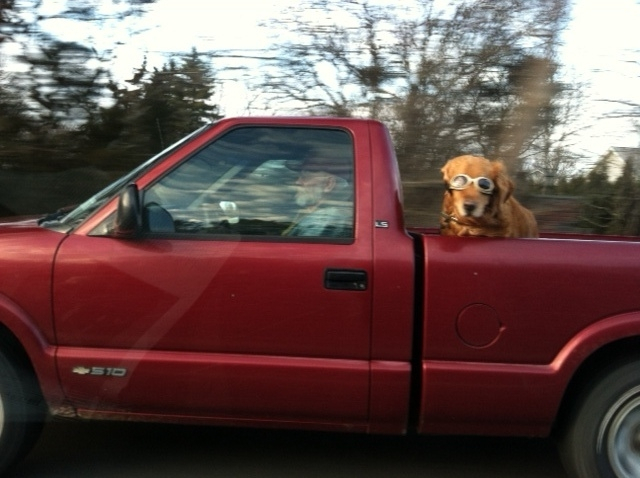 I love Goggles Dog, too. That dog not only belongs in LA, it belongs on a Wheaties box, ’cause it’s a champion! I too suffer from a treacherous stomach. The things most likely to set my stomach off? tomatoes and cannabis. God is cruel sometimes. I am a sometimes (most recently Wed-Fri) an insurance professional. Don’t hold it against me. I suspect most people’s favorite ‘bation’ is masturbation. It’s only my second. My favorite is perturbation. I’m weird like that. I’m pretty sure that the insurance guy I was talking to wasn’t you, Smak, but you could have taught him a few elocution lessons. My favorite ‘bation’ is libation. Cannabis doesn’t agree with YOU?!? Yes, that sound is me howling with laughter at your predicament. Guess,you’ve got to give up those brownies, Mr. Toklas. Just when things are taking a dive, Goggles Dog saves the day. he is my new hero, Lame. He is definitely one cool canine, Kate, right up there with Macaulay! Goggles Dog may have to visit the vet now and then, but at least he never has to deal with health insurance. We’ve been getting nibbled to death by our insurance company, too. The premiums go up and the coverage goes down. Great post! You’ve got that right, bronxboy! Health insurance does keep costing more as it gets progressively worse. That is such a big bowl of wrong to me. Thanks for visiting and commenting! I second the woof! Love me some Goggles Dog. We tried to get our dog to wear Doggles, but she would have none of it. The dog in that picture is far more laid back than my dog. I guarantee you that my sister’s hound, Thurber, would be just like your dog. If he could free the middle digit in either of this forepaws I’m sure he’d flash it at anyone who would even consider subjecting him to that. Also, Thurber hates riding in the car. Thurber is such a great name! Named for James, no doubt. I dislike insurers too. Why can’t we just pee on them? Gee, why didn’t I think of that? There’s no such thing as a lame adventure. Love this blog! Shine on! Awwwwwwwwwww, thanks Wiley. I’m so flattered that such a handsome hound would visit my site. Wiley or Wile W.? You decide. Wiley or Wile E. ? You decide. Since we’re talking a pooch and not a coyote I vote “wiley”. Yeah, Guat, The Boss just happened to be in the right place at the right time with her iPhone when she got that shot. Glad it meets your seal of approval!